As a result of the Government of Canada commitment to legalize and restrict access to cannabis as well as increased concerns over road safety due to drug-impaired driving, Public Safety Canada and the RCMP, in collaboration with the Canadian Council of Motor Transport Administrators, undertook a pilot project with law enforcement from across Canada to test the use of oral fluid drug screening devices as tools to enhance the enforcement of drug-impaired driving. 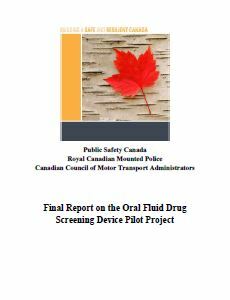 The objectives of the pilot were to examine the use of oral fluid drug screening devices in the Canadian climate, within applicable Canadian law enforcement practices, to develop and inform law enforcement training guidelines and standard operating procedures for device use, and to identify possible elements for inclusion as standards for the devices. In a previous study, “An assessment of oral fluid drug screening devices”Note 1, the devices were deemed reliable in their ability to detect the identified drugs. Therefore, the reliability was not re-examined as part of the objectives of this pilot. standard operating procedures and training guidelines that emphasize officer safety when deploying devices. This report contains further information on the methodology and results of the pilot project, as well as a summary of the recommendations for device standards, standard operating procedures and training guidelines. This report was developed in consultation with seven police jurisdictions: Vancouver Police Department, Halifax Regional Police Service, Toronto Police Service, Gatineau Police Service, Ontario Provincial Police, North Battleford RCMP, and Yellowknife RCMP. The Government of Canada has committed to legalize and restrict access to cannabis. As a result of this commitment, there have been increased concerns regarding road safety and the need for a comprehensive public education strategy, as well as support and investment in tools, training and technology to better detect drug-impaired drivers. In line with the Government mandate, as well as with the strategic objectives of Canada's Road Safety Strategy 2025, Public Safety Canada and the RCMP, in collaboration with the Canadian Council of Motor Transport Administrators, undertook a pilot project with law enforcement across Canada to test the use of oral fluid drug screening devices as tools to enhance the enforcement of drug-impaired driving in Canada. Two oral fluid drug screening devices – the Securetec DrugRead and the Alere DDS-2 – were selected for the pilot project, based on recent literature and the portability of the devices. On December 13-14, 2016, a training session was held for 24 police officers from seven police jurisdictions: the Vancouver Police Department, Halifax Regional Police Service, Toronto Police Service, Gatineau Police Service, Ontario Provincial Police, North Battleford RCMP, and Yellowknife RCMP. Coordinating officers and frontline officers were trained on how to use the two oral fluid drug screening devices and agreed to train two to five additional police officers on their use. Each police officer also committed to collecting a minimum number of 10 oral fluid samples on each device. Samples were collected from volunteer drivers and passengers. Each police service was asked to conduct between 100 and 170 samples on each device, in total, with the exception of Yellowknife which, due to a smaller population, was asked to collect 50 samples on each device. Police services began deploying the devices on December 18, 2016. As a result of a staggered deployment on the part of some police services, the initiative occurred over eleven weeks in total. Data collection closed on March 6, 2017.
identify possible elements for inclusion as standards for the devices. There were three main data sources for the pilot project: (1) weekly coordinator conference calls; (2) roadside questionnaires; and (3) individual officer interviews. Weekly coordinator conference calls consisted of one-hour calls with officials from Public Safety Canada, the RCMP, and coordinating officers of the seven participating police services. The goals of the conference calls were to identify high-level issues regarding the ad hoc standard operating procedures when deploying the devices and to assist in the identification of obstacles faced by officers during testing, including maintenance of the devices and supplies, such as swabs and cartridges. The roadside checklist was a one-page questionnaire, completed by officers every time they conducted a screening with a device. The checklist gathered information on the conditions that officers dealt with when deploying the devices, such as weather, temperature and lighting, as well as any issues or malfunctions that might have occurred. The checklist also contained questions regarding officers' comfort levels with the devices and perceived ease of use. Finally, the checklist contained a “comments” box for officers to record any additional information they judged pertinent to the study. Officers also attached the test result printouts from the devices with all checklists sent to Public Safety Canada, that identified which drug(s), if any, were present in a volunteer's sample. Phone interviews were the third form of data collection. Throughout the pilot project, two officers from each police service were asked to participate in two personalized interviews, once at the beginning of the pilot and once at the end. The purpose of the interviews was to discover more detailed information that was not practical to record in the roadside questionnaire, such as personal ad hoc standard operating procedures being used by the officers (e. g., device storage, where a device was deployed). The interviews allowed Public Safety Canada officials to delve deeper into officers' views and perspectives on the devices and their use at the roadside. The interviews also provided an opportunity to troubleshoot any issues officers might have encountered during the deployment of the devices at the roadside. In addition to the 24 officers who participated in the original training in December 2016, participating police services trained an additional 29 officers on the use of the devices, for a total of 53 trained officers. 83% of swabs were administered by officers trained in Standardized Field Sobriety Testing (SFST), and 55% of swabs were administered by Drug Recognition Experts (DRE). These officers collected samples in more than 25 communities across Canada and, on average, collected 21.5 samples each, meeting the target of a minimum of ten samples per officer on each device. Oral fluid samples on the two devices were collected through random stops (59%) and roadblocks (36%, e.g., RIDE program), with 80% collected from drivers, and 20% from passengers. With respect to the unique climatic conditions in Canada, testing occurred under a variety of conditions, including: “clear” (913 tests, 80%), “snowy” (139 tests, 12%) and “rainy” (80 tests, 7%) conditions. The recorded temperatures ranged from -50°C to 26°C. Tests were conducted at all times of the day (light conditions 64%, dark conditions 36%). An important aspect of the pilot project was to determine whether the devices were user friendly and able to be used by police at the roadside. In the questionnaire, officers described the devices as either “Very Easy” or “Easy” to use in 91% of the samples taken. Furthermore, in 92% of the samples taken, officers reported they were “Comfortable” or “Very Comfortable” deploying the devices at the roadside, with less than 3% reporting the devices were “Difficult” or “Very Difficult” and “Uncomfortable” or “Very Uncomfortable” to use. Ease of use and comfort level were lower when officers were less familiar with the devices, but improved as officers conducted more tests. 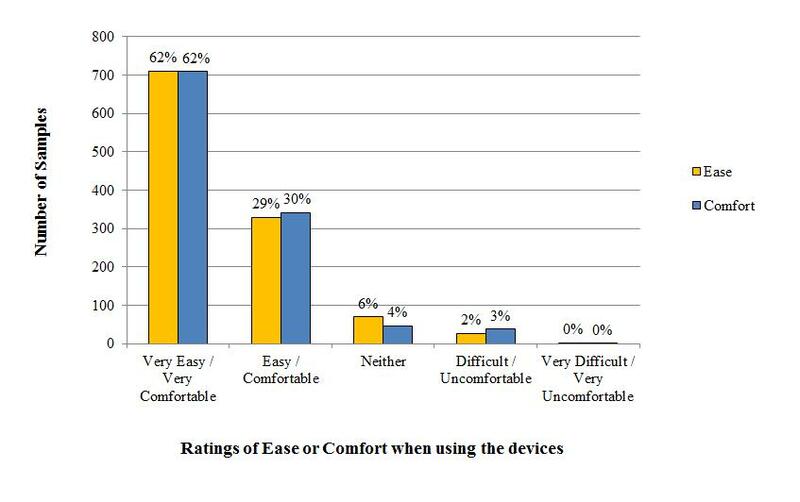 While some officers may have reported a personal preference for one device over the other, there was no difference between perceived comfort and ease of use on either device. Additional data supports the assertion that the devices are easy to use: 94% of swabs were properly analyzed on the officer's first attempt, with only 6% of swabs requiring additional attempts to obtain a result. Figure 1 provides the exact values of the frequency of ratings, compiled through questionnaires. The data illustrates that 711 officers most frequently described the devices as very easy (62%) and 329 officers described the devices as easy to use (29%). The officer’s comfort ratings with the devices were nearly identical with 710 officers describing themselves as very comfortable (62%) and 342 officers finding the devices comfortable (30%). Overall the figure illustrates the majority of ratings of ease of use and comfort are positive. In the very few instances where multiple attempts were required to successfully submit an oral fluid sample for analysis on the devices, officers reported that correcting the procedure was easy. The causes of multiple attempts were most frequently related to obtaining sufficient oral fluid using the Alere DDS-2 or needing to re-insert the swab into the device reader of the Securetec DrugRead, both of which could quickly be rectified at the roadside. Officers found the procedural steps for conducting a test at the roadside simple to follow and remember. In 98% of all the samples taken, no steps were forgotten. On average, each procedure (i.e., explaining the test to the volunteer, collecting the sample, analyzing the sample through the device and debriefing the volunteer) lasted 9.3 minutes (9. 6 minutes with the Alere, 9.1 minutes with the Securetec). Given Canada's harsh temperatures and weather conditions, and considering police officers conduct sobriety tests in all weather conditions, one of the main focuses of the pilot project was to determine how the devices work in all weather conditions. During the pilot project, police officers were asked to note any malfunctions that occurred due to temperature. This temperature aspect is important because the manufacturer's suggested operating temperatures for the cartridges range between 5°C and 25°C for the Securetec cartridges, and 15°C and 25°C for the Alere cartridges. The range for the devices is between 5°C and 40°C for the Securetec and -20°C and 45°C for the Alere. There was proportionally no increase in the number of tests with a reported malfunction when broken down by the weather conditions under which the sample was taken. Overall, 219 (19%) tests were conducted in snowy or rainy conditions. Furthermore, 731 (64%) tests were conducted outside of the manufacturer's suggested operating temperatures for cartridges. While the devices worked in all weather conditions, there were some temperature-related issues that arose when the devices were used in extreme cold temperatures. Proportionally, tests conducted outside of suggested operating temperatures were more likely to produce drug-positive results (i.e., while 64% of all tests occurred outside of suggested operating temperatures, 80% of all positive results were produced outside the suggested range). At present, it is unknown whether this finding is attributable to technical or procedural issues, for example whether the devices are more likely to show positive results when tested in extreme cold temperatures. Consequently, further research on the reliability of devices used outside of standard operating temperatures is merited. Officers did not report significant difficulties or a greater proportion of device malfunctions when using the device in the various weather conditions. Furthermore, officers only noted temperature-related difficulties causing a malfunction in just 1.2% of all samples collected. For example, one officer stated that when it was too cold for the device to operate, he “blasted the heat” from the car vents until the device started to work. As police conduct sobriety tests at all hours of the day, for the purposes of the pilot, officers were asked to deploy the devices in a variety of lighting conditions (e.g., morning, afternoon, night). Over one third of the samples taken (406) were conducted in conditions officers described as “dark”, and 730 samples were conducted in “light” conditions. Officers were no more likely to have a malfunction or miss a procedural step based on lighting condition. Consequently, the pilot showed that officers were able to successfully deploy devices in all lighting conditions. During the training sessions in December 2016, officers mentioned concerns related to device durability. Consequently, officers were asked to not handle the devices with any special care throughout the pilot to assess device durability. Durability was assessed during interviews through open-ended questions on how officers handled the devices. The vast majority of interview respondents did not experience any durability issues. For example, one officer mentioned having accidentally knocked the device across the vehicle and out the open passenger-side door, with the device not sustaining any damage. Another officer mentioned having dropped the device at the roadside and had no issues afterwards. Despite initial concerns during the training session that the Alere DDS-2 was not stored in a hard case, no officers mentioned durability issues with the soft casing throughout the pilot. Three of the Securetec devices were broken during the pilot; one device was unable to power on, and two devices had their screens cracked rendering results unreadable. Any devices broken during the pilot were sent back to the manufacturers for diagnostics and repair. In order to ensure that the devices are adaptable tools for police operations, officers were asked several questions that focused on the procedural steps taken to deploy the devices at the roadside and concerns related to officer safety. The two most common concerns mentioned by officers were the amount of time required for a screening and the physical proximity to the driver being screened. Specifically, officers noted that the Securetec analysis time of approximately eight minutes could put officers in a vulnerable position. When asked to troubleshoot solutions for the length of time, officers noted that in a real situation, a possible solution could be to have a driver sit in the police vehicle. Although the Alere device can analyze results much faster, officers proposed concerns related to the length of time required to obtain enough oral fluid for analysis, as it could take more than two minutes to acquire enough fluid. Some officers proposed that in a real situation, if a driver was physically capable, the driver could manually hold the swab personally until there was enough oral fluid in the swab. In fact, many of the officers in the pilot project put this into action and reported back that it was very easy to do with a compliant volunteer. With respect to physical proximity, officers raised concerns with needing both hands to operate the Securetec device while in close proximity to a volunteer, and with administering the Alere swab themselves. Among the officers, there was a general agreement that different actions would need to be taken depending on the device being used. For example, officers were more likely to collect swabs themselves when using the Securetec device and, although they raised chain-of-control issues with respect to having drivers collect swabs themselves, overall, the consensus was that with the Alere device, the level of safety for the officer would be increased if the driver collected the swab personally. Officers were confident that the effective use of the devices and officer safety could be achieved through standard operating procedures, training guidelines and device standards. Data was collected on device malfunctions, which occurred in 13% of samples. Malfunctions do not refer to instances where the device produced an incorrect result or did not function at all; malfunctions refer to instances where the devices did not function as expected by the officer (e.g., device powers off during analysis). The majority of malfunctions (46%) were related to printing issues (e.g., Bluetooth connectivity, printout paper ripped). Considering the printer malfunctions, which could be solved easily by printing sample analysis results at the detachment (i.e., the devices store all analysis results), the true likelihood of a malfunction (e.g., issues caused by temperature, power/battery, weather or other/unknown reasons) is approximately 7 percent. It is important to note that no single malfunction captured under “other” (e.g., errors with cartridge, not properly inserted) accounted for more than 1% of tests. Although the inability to keep a device level (i.e., tilt malfunction) was commonly mentioned as a hindrance to conducting an analysis, it only occurred in 6% of all malfunctions (i.e., less than one percent of all samples). Other common malfunctions, such as the improper insertions of cartridges were the result of the device swabs not being completely inserted and could be corrected easily by re-inserting the cartridge. The graph above shows a breakdown of the different types of malfunctions experienced by officers using the devices during the pilot. Overall, malfunctions occurred in 151 (13.2%) of the samples collected. Originally, officers were asked to describe malfunctions as caused by temperature, weather, power/battery, unknown or other. As a result of the large volume of “other” responses, three additional categories (i.e., tilt, operator error, improper insertion of cartridge) were added. The remaining malfunctions reported as “unknown”, such as devices returning false positives, have been sent to device manufacturers for diagnostics. Noteworthy, two of the Alere devices and one Securetec device began registering exclusively drug-positive results, including when tested on the police officers. Consequently, these devices were returned to the manufacturer to identify possible causes. One other malfunction pertains to the Alere swabs, as several swabs began to leak buffer fluid when placed in the mouth of the volunteer. The manufacturer has since stated that this fluid creates no health concerns and will be assessed. It is noted that higher drug-positive tests at low temperatures did not correspond with device malfunction notifications of any kind. It is crucial to note that the devices did not report a temperature malfunction every time the device was used outside of the suggested operating temperature. While the Alere device notifies users of an error code when operating outside the suggested operating temperature range, it does not distinguish if the error is with the device or the swab. Although temperature malfunctions were reported 14 times (i.e., the device alerted the officer), 717 out of the 731 tests across both devices were conducted outside the cartridge temperature range, with no error message showing. 654 tests were conducted at more than ten degrees lower than the suggested operating temperatures for the cartridges. Consequently, it is possible that “other” and “unknown” malfunctions resulted from these temperature discrepancies. As the devices have an approximate 95% reliability, false positives can occur; however, this risk can be mitigated through rigorous device standards or other screening techniques (e.g., SFST, DRE). Pilot findings related to temperature could be further investigated in a controlled setting by comparing oral fluid results to other analyses (e.g., blood) of known concentrations in live participants. As part of the guidelines of the pilot project, all volunteers were screened for any sign of impairment by the police officer administering the tests, and any volunteers who showed signs of impairment were not eligible to participate. Of the samples taken in the pilot project, approximately 15% registered a positive drug reading, and 43 of the 53 officers involved in the pilot project collected at least one drug-positive sample for any drug. The devices are set to indicate positive results when a specified nanogram level is detected in the oral fluid. Based on the positive samples collected , the most common drugs found were cannabis (61%), followed by methamphetamines and amphetamines (23% each), cocaine (14%), opiates (9%) and benzodiazepines (3%). It is important to note that presence of a drug in the oral fluid does not imply impairment. Considering volunteers were screened for impairment before participating, the observed rate of drug-positive tests may be explained by the lower reliability of the devices when testing for certain drugs (e.g., benzodiazepines) compared to other drugs where there is a higher reliability (e.g., cannabis). It is crucial to note that devices will need to meet Canadian reliability standards in order to be deployed in Canada. As mentioned, two police services indicated the possibility of three defective devices, which could have artificially inflated the numbers of drug-positive tests. However, as this study was not controlled and oral fluids were not analyzed in a laboratory, it is impossible to remove these tests from analysis. Of the 148 drug-positive tests, 38 (26%) were positive for more than one drug. The most common combination of two drugs was methamphetamines and amphetamines (15 samples), and either methamphetamines or amphetamines were present in 89% of poly-drug instances. Cannabis was present in combination with other drugs in 42% of poly-drug instances (16 samples). Evidence supports the need for hands-on training with the devices. Qualitatively, the majority of officers interviewed reported that the training provided was beneficial. The majority of the feedback on training focused on providing officers more opportunity to practice with the devices. A greater proportion of officers trained at the initial training session, which provided the scientific basis of the devices, a practical hands-on component with expert device technicians, and an opportunity to ask technical questions, found the devices “Very Easy” to use (67%) or “Very Comfortable” (69%) versus the officers who did not attend the training sessions (56%, 53%). More than one of every seven tests (15.2%) conducted by officers who did not attend the initial training sessions resulted in a failure to return a result, compared to just one of every seventeen tests (5.8%) conducted by officers who attended the initial training sessions. Further, officers who were not trained at the initial training sessions were almost twice as likely to experience a device malfunction (17.8% compared to 9.7%), about one and a half times as likely to encounter at least one difficulty when collecting a swab (47% compared to 33%), and three times more likely to find that the device interfered with standard operating procedures (9% compared to 3%). Figure 3 shows the exact percentages of ratings by officers with and without formal training on the oral fluid drug screening devices. The data illustrates that: (1) officers were more likely to describe themselves as very comfortable with the devices when formally trained (69%) than when they had received no formal training (56%); (2) officers were more likely to describe the devices as “very easy to use” when formally trained (67%) than when they had received no formal training (53%); (3) officers were less likely to fail to return a result when formally trained (6%) than when they had received no formal training (15%); (4) officers were less likely to encounter a difficulty administering a swab when formally trained (33%) then when they had received no formal training (47%); and (5) officers were less likely to find the procedure of using the oral fluid drug screening device interfered with their standard operating procedures when they were formally trained (3%) than when they had received no formal training (9%). Overall, the figure illustrates that officers who had received formal training on the oral fluid drug screening devices were better equipped to deploy the devices than officers who had not received formal training. The pilot project examined whether there would be any difference between the results obtained by officers who were SFST trained, officers who were DRE trained, and officers without either training. The analysis showed that the officers most likely to find the devices easy to use were DRE-trained officers (74%), followed by SFST-trained officers (65%), and officers with neither training (50%). The results indicated that the officers who showed the highest level of comfort with the devices were DRE-trained officers (76%), followed by SFST-trained officers (65%). Officers with neither training felt very comfortable using the devices in less than 50% of the samples collected. When considering difficulties in deploying the devices and following procedures, there were only negligible differences between the three categories of officers: DREs (30%); SFSTs (40%); and officers with neither certification (36%). However, the higher ratings of ease and comfort by DRE and SFST-trained officers suggest that these qualifications better prepare officers to deploy the devices and adapt to their use. Oral fluid screening device technology has been successfully deployed in other jurisdictions with positive results. The findings from the previous study on oral fluid drug screening devices showed the devices are reliable in their ability to detect specific drugs. The results from this pilot project indicate that with the proper training and standard operating procedures, these devices are a useful additional tool for Canadian law enforcement to better detect individuals who drive under the influence of drugs.